AI is expected to be used commercially, either built into existing hardware or as an adjunct technology. A few years ago, colonoscopes with three camera lenses entered the market. 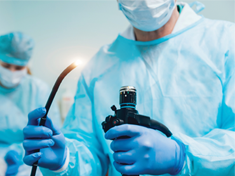 Until then, gastroenterologists who performed colonoscopies had relied for decades on a single-lens platform that provided a 180-degree field of view. The three-lens platform nearly doubled that figure and transformed colonoscopy, says gastroenterologist David Robbins, MD, medical director of Manhattan Endoscopy in New York, New York.